I can't believe it's already November! What what!? 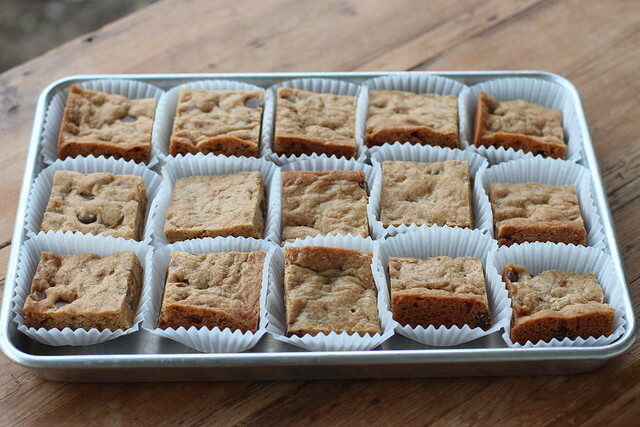 Here are some yummy blondies I made recently...to celebrate a fixed oven! My oven died for a few weeks. The repair person cancelled an appointment, then that got rescheduled, only to find out that the problem was electrical. Then we had to ask around for an electrician and that person finally came out to fix the issue. But...YES! The oven is back! Sweet. I just got the digital subscription to the New York Times. I already get the digital edition of the Los Angeles Times so more often than not, you'll find me reading the news my phone! I'm exploring more of the Food Section in the New York Times and this recipe looked great! 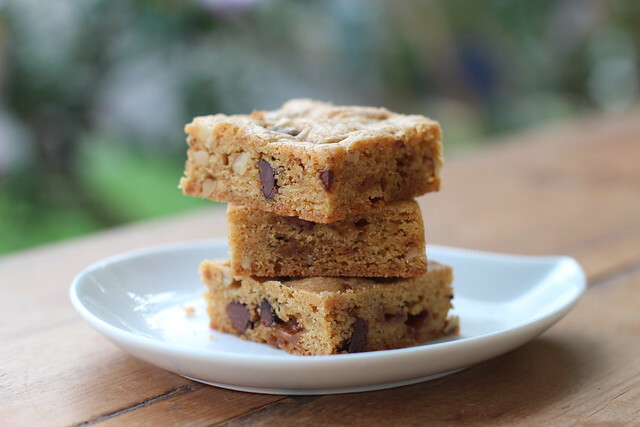 I really like Blondies because they are easy to cut and go. Sometimes scooping dough can take time so spreading it out in a pan makes life easy. You need to bring this to a meeting a work. I guarantee your co-workers will love you. 1. 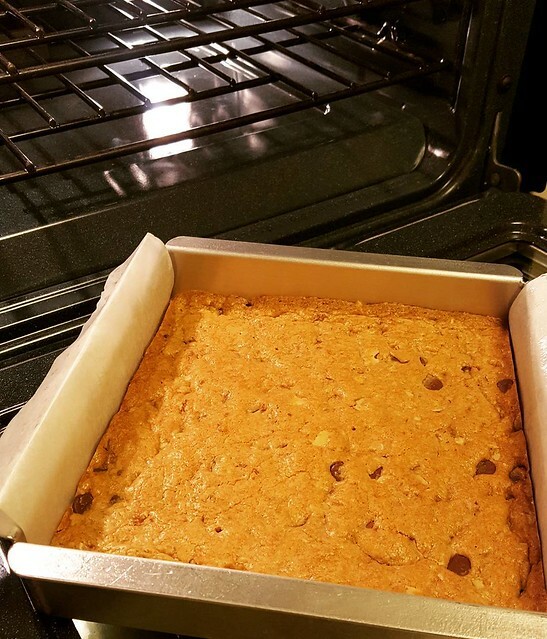 Prepare a 8-inch square pan. I make a parchment sling, sprayed with baking spray, for easy removal. 3. Melt the butter (1/2 cup or 1 stick) in a saucepan. Remove from head and stir in the sugar and molasses, and transfer the mix to a large bowl to cool. 4. In another bowl, whisk together the flour, baking powder, baking soda and salt. 5. When butter mixture is cool, whisk in the egg until slightly fluffy. 6. 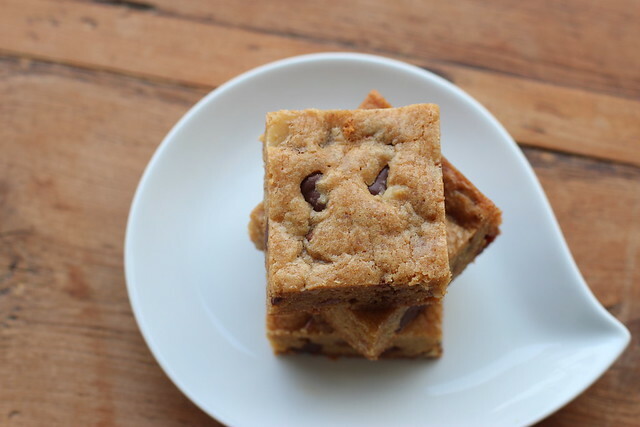 Fold the flour mixture, then the chocolate chips, Heath bar and nuts. 7. Spread the batter into the pan with an offset spatula. 8. Bake until golden brown and a toothpick inserted into the middle comes out clean, 27 to 30 minutes. 9. Cool then cut into squares. glad you're back--i've missed reading your blog!! This made election day much better, a post from Mary! I sure wish I was your coworker, I'm sure you're loved with or without the treats you provide. Nice hearing from you. :). Always a fan no matter what! I may even make these they look so easy.